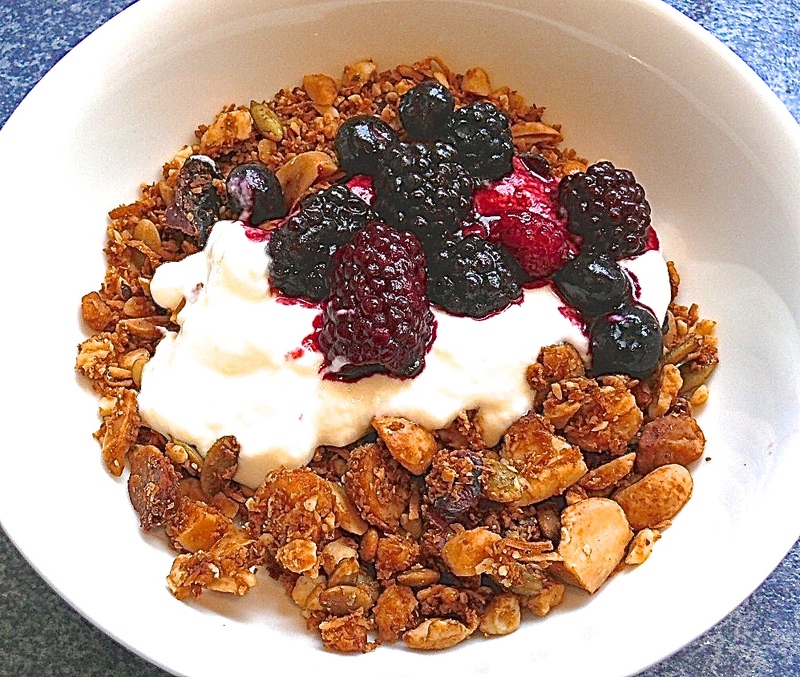 Nograinola – the nutty no grains & no gluten breakfast. Posted by Wendy Hay in All recipes, Breakfast, More or Less! I love my bacon and eggs in butter fry-up every day, and it really, truly doesn’t take so long to cook. However, even with the best of intentions some mornings can just go wrong all the way. I say it’s when the Morning Devils come out to play. You know how it goes – sleep through the alarm, nothing in the wardrobe looks right, poke your finger through your tights and then to add insult to injury you get that kink in your hair cos you’ve over heated it with your straighteners. Guys – you may not relate to the above but I’m sure there are Morning Devils at your house to. You can guess – cut yourself shaving, bleeds again on your clean shirt, iron a new one only to find a stain on the last bit you are ironing, can’t find your phone/keys/the other shoe, you know stuff like that! Cut with the ramble and get to the point! Here is something quick for your breakfast. It doesn’t take to long to prepare (well maybe an hour tops!) and keeps for a couple of weeks in an airtight container. So on those mornings when you need breakfast in a rushola, grab a bowl of Nograinola. Throw on a blob of Greek yoghurt/cream/almond milk and add a handful of berries or whatever and you’re good to go. Just a warning, this mix is so totally delish that it is hard to resist taking sneaky handfuls straight from the jar! • Line a large baking tray with cooking or parchment paper. • Mix all the nut and dried fruit together in a bowl. 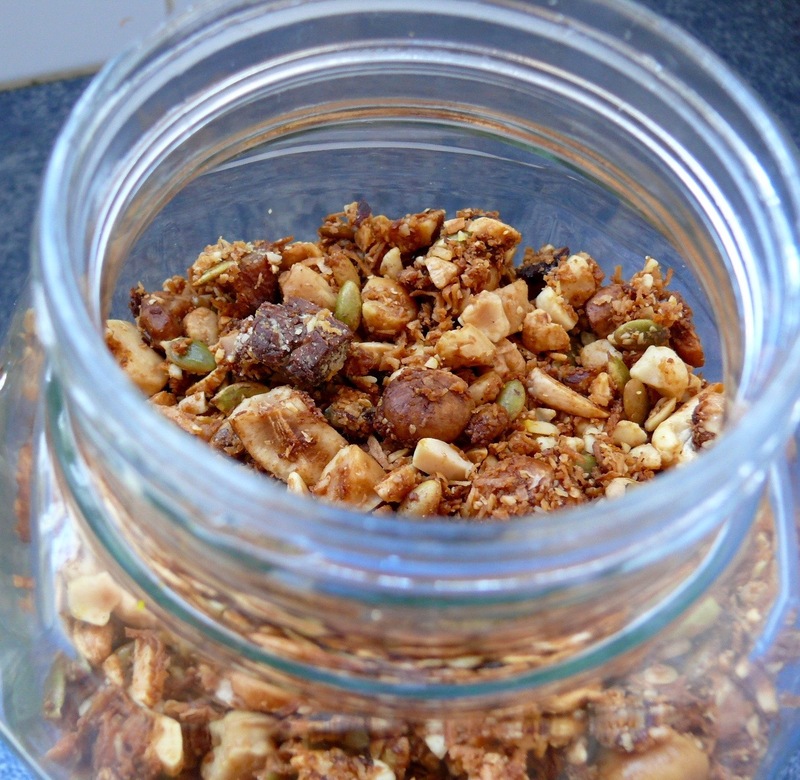 Note that you can use any of your favourite nuts and dried fruit, just keep the quantities the same. • Place 2½ cups of this mixture into a food processor and process until the mixture has fine and medium sized crumbs. • Mix these and the rest of the nuts, dried fruit, pumpkin seeds and coconut together, manually chopping any really large nuts. • Mix in previously melted together maple, honey and coconut oil along with the vanilla extract and the orange zest. Don’t over mix as you do want to leave some clumpy for texture. • Spread evenly in the baking tray and place in the oven. *Note the following baking times can vary depending on temperature variability of ovens, so just check a minute or so before each bake time. What you are looking for is a nice golden colour at each bake. • Bake for *10 minutes, remove from the oven and mix up then re-spread. • Bake for a further *7 minutes, remove again and mix up then re-spread. • Bake for a final *5 minutes remove from the oven and leave to cool completely. • When completely cool, spoon into an airtight container. • Leave as many large chunks as you like, all break it all up small. Serve with your favorite topping. Greek yoghurt, cream or if you are dairy free then coconut or almond milk. Add berries or your favorite fruit. A handful of this is a great trail mix snack. Add some 85% Dark Chocolate for further yumminess! So there you go. Breakfast in a Rushola (sorry I did like the way it sounded). And if you don’t need to rush, then why not fix some buttery Hollandaise sauce and serve that over your favourite eggs? This mix, particularly the three baking times was inspired by the yummy recipes from Irey’s Kitchen and there a loads of lovely recipes for a nutty breakfast out there so check them out too. After that I dare to to be brave and adventurous and mix up your own, then come back and let us all know your favourite Nograinola! Like what you see, then before you leave sign up for new recipes hot off the press!